The reinventing of a classic fairytale is nothing new, it’s as old as the spoken word, but in recent years there has been a rush on this trend. To do this successfully the talent lies in making each story its own. 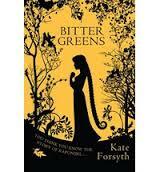 The book and author who has done this with finesse and expertise is Bitter Green’s by Kate Forsyth. In the reworking of the fable, Rapunzel, Forsyth has made a version that’s an intriguing blend of history and fairytale. It is through Forsyth’s extensive research that we are transported to the court of the Sun King, Louis XIV in France where we follow Charlotte-Rose de la Force, one of the first writers of the story Rapunzel. Charlotte is banished to a convent for her scandalous behaviour. (Charlotte- Rose de la Force is such a fascinating person that everyone should follow this book with one of the biographies of her life). It is here that Charlotte meets a nun called Seraphina who tells her the tale of a young girl, with long red hair, named Margerita (Rapunzel) who is sold by her father to a Selena Leonelli for some bitter greens. Selena, also known as the La Strega Bella, is the muse for the renaissance artist Tiziano. Kate Forsyth’s writing is like delicate lacework interweaving the stories of these women. Their lives are entwined through common threads of desire, love and obsession. We voyeuristically watch these characters through the hobbled streets of 16th century Venice and the grand palace of Versaille to the sparse convent of 17th century France. It is an intriguing journey of magic, tragedy, loss and consequences. Enjoy! NB This book was published early last year, but with Kate’s soon to be released Dancing on Knives I thought I’d review her book, which is most dear to me. « A book is a book, or is it?